We are headed back to Texas today. My heart is a little broken that our California vacation has come to end. We spent most of our days on the beach (we visited seven in five days) relaxing and soaking in the sun with our good friends. We couldn't have asked for better weather. Monday we spent 13.5 hours at Disney and California Adventures and closed the parks down. My friend had her pedometer with her and we ended up walking 15 miles, 35,000+ steps and burned over 3,000 calories. Let's just say that I am still hurting today and could barley walk Tuesday morning. It was worth every single ache and pain. Thank you Sharon, Tommy and your three precious boys for all your hospitality. California would not have been the same without your generosity and crazy memories we made along the way. And thank you Audrey, Tiffany and my blogging soul sister, Jenn for meeting up with us during our stay. Getting to see my blogging buds was icing on the cake. Unfortunately, we are now back to reality and in full back to school mode. How did this happen? I wore this off-the-shoulder top and white cut off shorts during our last day in San Diego. The top was another Marshall's last minute find before we left. The $14.99 price tag couldn't be avoided. It can be worn on top of the shoulders too and still looks cute. This will be great way to wear it when the summer months have ended. I loved the pattern and lightweight material and hoping to add another one to my closet soon. Below are a few I have my eyes on. You look super pretty in your off the shoulder look!!! When I took my older kids to Disney Land I too was soooo sad when it was time to go home! I am looking forward to when I get to take my two younger kids (which obviously weren't born when we took our other two girls)!! Looks like you had a great vacation! I can't believe how fast this summer went by! I am looking forward to the fall though lol! You are AHHMAZING and looking so fresh and every inch the California girl Shanna....I'm so happy to hear you had a blast and enjoyed the last remaining days of Summer, pre-back to school! And two thumbs up for us both rocking the boho look!!! Wow you did a lot in 5 days! I don't think I've ever stayed at Disneyland more than 8 hours and usually the family is os exhausted. Sounds like you had a fabulous vacation and hope one of these days we can meet up too. ok i need some off the shoulder tops, like now!! Gosh you did have a packed vacation, sounds fun though. Loving the top, super chic. Your top is very cute, its good your had an great trip. What an amazing, fun-packed 5-day vacation. WOW!! I want to take my little girl to Disney one day. Love this look. The top and necklace are gorgeous and it is all styled so well. 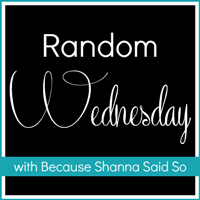 Have a Great Wednesday and rest of the week, Shanna!! gorgeous top, you look beautiful. You look so comfy. Love those sandals. So pretty!! 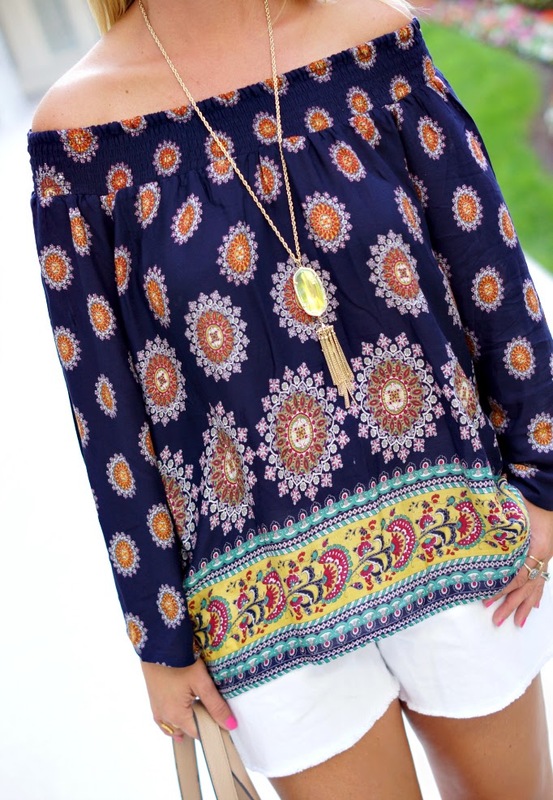 I love anything off the shoulder and this top is perfect! Sounds like an amazing trip! My kids are already back to school and it is exhausting! I love that top on you...very chic. This off the should is great on you! Paired with the white shorts, it is the perfect vacation outfit. Sounds like an amazing trip! Glad you got to do it. Love that top! So fun and Summery! You are looking stunning in this outfit and love your off-shoulder top, short and your accessories. Wow! I need your top and your Kendra Scott necklace! So pretty! Sorry to hear the your vacay is already over. Hope you had a great time! The top is adorable! I am obsessed with the colors and style! What a great look on you, not that anything isn't great but really liking the slight boho vibe. Love the pedometers for keeping us motivated, I use a fitbit now and its amazing how many steps we take on vacations. I love that pattern, and you can't beat the price! Great find. What a trip! Way to rock it out in the parks and still get your relaxing in on the beaches! Such a cute top! I am dying to visit California sometime, but first up is Austin, Texas in September! I can't wait!!! Such a cute look Shanna!! I have such a crush on your style! Seriously though, where did summer go?! I can't believe it is over. Whaaaa! Glad you had such much fun. I saw Shaylyn and we are going to need to get together soon! You look amazing in this outfit. So summery and chic. Have a wonderful Wednesday! off the shoulder is one of my favorite looks! so pretty! 7 beaches in 5 days!? wow! That top is so cute! Glad you had a fun trip here in Cali. 7 beaches in 5 days? I'm impressed!! LOVE this outfit and LOVE you! Seriously almost cried when I left. Wish we could have had more time together but SO happy you and the fam had such a wonderful time here in CA! Love you to pieces girlie! Glad you had an amazing vacation in my home state! And you brought that killer style with you! If this outfit doesn't scream Cali vaca...I don't know what does. Love it! So glad you had such a great time and have a safe trip home!! very nice off the shoulder! i likey!!! Happy to hear you had a wonderful time away! Very cute top and nicely paired with the white shorts. I LOVE that top! Looks so gorgeous on you! yay for having such a wonderful time in California! I can't wait to go back next month... missing the glorious sunshine! I'm glad you had a great time! You are making me want to go to California! I've only been to San Francisco in the past but I've been dying to visit some of the beaches! And I love this outfit so, so much! Glad you had fun in California! You look Cali-chic in this outfit! Cute outfit!! love hat top. Cute outfit!! love that top!